Siberia, Russia, Singapore – what could they have in common? Only the faith and people who have once left their Motherland. 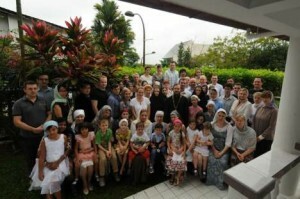 It is to give spiritual support to these people that the parish of Dormition of Mother of God in Singapore was set up. Located quite far from the city centre, it nevertheless has some 300 parishioners: not only ethnic Russians but also those who, irrespective of their origin or language, want to come in touch with Russian Orthodox culture. Parts of the Sunday morning service there are delivered in five languages. One world, one Russian Orthodox culture, one Orthodox church in a city-state with a population of nearly seven million people. The rector of the church, Father Aleksandr, has kindly agreed to tell us more about his parish community. Father Aleksandr, who are you parishioners? What do they have in common? On a Sunday, there are 70-80 people praying at the church. On big religious holidays, this number rises up to 300 people. The majority of parishioners are our compatriots who have come to Southeast Asia for work. The number of those who have taken Singaporean citizenship grows every year. There are also mixed families. We have developed a tradition of getting all together for tea or a small meal after Sunday and feast-day services that all parishioners are invited to. Gatherings like these allow the parish to feel like one big family. You have an amazing Sunday school for children. How many children attend it on a regular basis? Who the teachers are? The Sunday school was set up in 2009. The number of children attending it has been constantly on the rise. Today there are 35 of them and the growth potential is limited only by the space available, that of the school and the church. The children study the Scriptures, Russian culture (Russian language and literature with an emphasis on our Orthodox Church heritage), do handicrafts. The teachers are nuns who serve at the church, Sister Esfir and Sister Olimpiada, as well as professional teachers from among the parishioners, Tamara Fedorova and Yelena Drozdova. As a rule, children attending the Sunday school are not only children from Russian families who have come to Singapore but also children from mixed families, who for whatever reason have decided to go to this school. What are their motives? How many children like these are there? Children from mixed families make up about a third of all the pupils at the school. Usually, parents, having come up against the realities of modern life, realise that neither the modern school nor they themselves are capable of protecting their children from moral decay and consumerism that has been imposed on society. By bringing up children in the customs and principles of Christian life, we are trying to help shelter them from numerous trials and ordeals that they will inevitably encounter in their future life. Your church is located quite far from the city centre. If a new church is built in a different part of the city, do you think it will affect your church-attendance figures in future? Building a church in another part of Singapore would push attendance figures up rather than down. There are quite a lot of Russians living in Singapore today and I am sure that both churches will be well attended. During the service at your church, the prayers are said in five languages: Russian, Greek, Chinese, Japanese, and English. Is there a similar tradition in other Russian churches abroad? The Lord’s Prayer is said in the languages of people who come to pray at the church. This tradition is observed by many Russian Orthodox Church parishes abroad. There are often 10-15 English speakers attending the Liturgy. To make them feel included, we read some of the litanies in English. Similarly, some of the parts of the service are sung in English. It helps us to constantly remember that the Church is universal and is not limited either by language or ethnicity. How often do Russian priests visit Singapore? Don’t you sometimes feel isolated? Bishop of Solnechnogorsk Sergiy (Vicar of His Holiness Patriarch Kirill) visits Singapore several times a year. There are also several other visits every year. Our parish has a tradition of making a pilgrimage once a year. Our Singaporean parishioners have twice visited the Holy Land and Russia once. This year we are planning a pilgrimage to Ukraine. During our travels, we constantly feel the warmth and support of our fellow Orthodox believers. Everybody is always genuinely interested to meet a group of pilgrims from Singapore! Like on the latest trip, everybody was touched to see an Indian lady in the group of Russian Orthodox pilgrims. I hope that very soon the Orthodox Church in Southeast Asia will become bigger and stronger and people will no longer be surprised to see a group of pilgrims from Singapore!